As we turn the final page in our calendar and realize that another year has passed, we tend to take some time to remember the year that is nearly behind us, while looking forward to the year ahead. For many, this time of reflection provides a chance to review lessons learned, while making plans for the upcoming months. Community association managers and management companies often focus on tricks they may have learned to save money or time for their communities. They also think of ways to save even more in the upcoming year. Taking some time out of these last few, busy weeks of 2014 to review any important steps taken at your community to save resources over the past year can help you create a plan to implement great cost saving measures in 2015. Some dedicated association managers/management companies have chosen to share their year-end reflections with us. Throughout 2014, it has become increasingly evident that community associations and their boards have higher expectations of their management companies today than ever before. Their management issues are more complex with growing financial challenges. Recognizing that board members and their committees are all volunteers, they are expecting more sophistication from their partners to help them manage their associations efficiently. MAY Management Services has recognized this growing trend and has enhanced its organization with extensive training and development programs, leading-edge software programs to streamline financial processing for boards, an annual legal update presentation for our boards, plus ongoing complimentary seminars and director certifications. “Sharing Best Practices with boards and their committees strengthens our working relationships, and the big lesson learned here is how much these efforts are appreciated by our clients since it makes their volunteer jobs easier,” says Al LeBeau from MAY Management. As the company enters its 26th year of serving community associations in Northeast Florida, they plan to continue to grow and adapt to serve the changing needs of their clients in a proactive fashion. This coach home and mid-rise condominium community comprised of 131 residences in Naples has tackled several cost savings projects within the community in 2014. By switching the property over to LED lighting, they have seen a savings of nearly $400 per month. In addition, they have implemented a three-zone lighting strategy in the underground parking garage. The inner zone lighting, away from walls and outside light, is always on. The lighting in the center where the vehicles drive is set on motion detectors, and the outer zone turns off when it detects the sun is providing natural light. In 2014, several of the communities managed by Aegis tackled projects designed to save them money in a variety of different categories. Exchanged incandescent lighting for LED. Installed an energy audit and tracking system to accurately split power consumption between common areas and commercial spaces. Installed wells for reduction of irrigation water use from public utilities. Saved thousands of dollars by switching between 1120 and 1120H forms. Sought and received refunds for taxes paid incorrectly in previous years. Installed ET-based irrigation timers that monitor weather and climate, as well as macro conditions on each zone (plant type, soil type, shade aspect, etc.) and then water only as needed in those zones. Some irrigation savings have totaled 70 percent. In addition to the above timers, some associations have also converted to drip, mister, and other microirrigation components, further reducing water use. Switched to a third-party contractor and saved on maintenance bills. Aegis is currently working on a program whereby several adjoining communities share the cost of a single, mobile patrol to monitor use of community amenities. The patrol would visit each amenity, in most cases, every 30–40 minutes and the cost is shared among six to seven communities. Submetering is when a community has one common municipal water meter for the property, and everyone pays the assessments in part to cover this expense. By submetering, the community can get reimbursed for a portion of the original bill, and as a positive side effect, the consumption of water drops dramatically. It also helps to even the expense for the homeowner; by submetering each home, owners are billed for the actual usage of that unit. This is a much fairer system and helps people realize how much water they are using, which in turn helps the overall usage drop. In addition, the 2014 Florida legislative session presented Associa and other industry colleagues with a unique and vexing challenge. 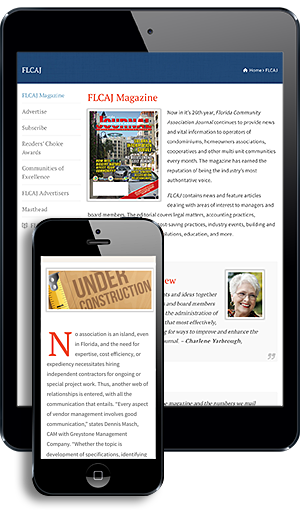 The Florida Bar Association’s Real Property Section decided that several areas of work lawfully done by community managers for more than a generation were actually the practice of law. This meant that only lawyers could perform enumerated tasks. For associations, this would mean the sending of a pre-lien letter and determining the number of days’ notice needed for a meeting and other ministerial tasks could no longer be done by managers. Looking to 2015, Associa expects that the challenges will remain similar. “Our goals looking forward are to continue to raise the bar for professionalism in the industry, to protect our clients and our business from needless regulations, and to work within the industry to build a bright future,” Hall says.